Her texts were set to the compositions of some of the most prominent gospel song composers of the day including William Bradbury, William Doane and Ira Sankey. Crosby composed under a number of pen names. She married blind musician Alexander Van Alstyne. British hymnals identify her as Frances Van Alstyne, her married name. This hymn first appeared in the collection Bright Jewels (1869), compiled by Bradbury, Doane, W.F. Sherwin and Chester G. Allen, at least two of whom were famous writers of gospel song tunes. Indeed, it was Doane who wrote the music and then gave it to Fanny Crosby to add the text—a practice that was not uncommon in their relationship. The glory of the Cross, a theme of the refrain, is a common metaphor of Romantic-era hymnody. The Cross, a place where the pain of earth and the joy of heaven come together, is a kind of spiritual altar to which we might draw near for refuge and solace. From it flows a “precious fountain”—an image perhaps borrowed from the 18th-century poet William Cowper and his hymn “There is a fountain filled with blood” (UM Hymnal, No. 622). Though an instrument of cruel punishment and torture, the Cross is a source of a “healing stream” (stanza one) and a place where “the bright and morning star sheds its beams” on us (stanza two). Stanza three invites us to meditate upon the Cross—“bring its scenes before me.” The “shadow” of the Cross falls on my daily path. This image is reminiscent of another Romantic-era poet, Elizabeth C. Clephane, who in 1872 wrote “Beneath the Cross of Jesus” (UM Hymnal, No. 297). 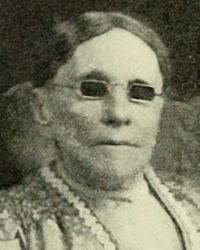 Many writers have commented on Fanny Crosby’s ability to employ the technique of hypotyposis—painting a vivid scene as if it were present—even though she was blinded soon after birth.